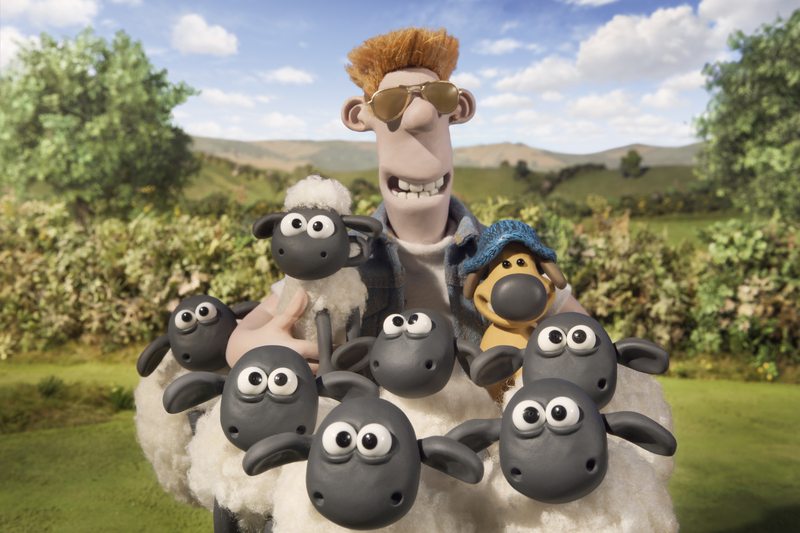 “Shaun the Sheep” opens Wednesday at Point, Palace and Star Cinema. PG, 1:24, three stars out of four. But my theory grinds to a halt with the British studio Aardman Animation’s “Shaun the Sheep Movie,” as there are no lines to quote. There is not a line of dialogue in this 84-minute film, just bleats, grunts, growls, sighs, and the occasionally wordless singing. Which means the folks at Aardman have to be as clever at telling their story as they are at showing it via their trademark stop-motion animation. Of course, anyone who has seen “Wallace & Gromit” or “Chicken Run” knows “clever” isn’t a problem for Aardman. And “Shaun,” based on a series of cartoon shorts, is a delightful addition to the handmade oeuvre. Its dialogue-free story means that it will especially appeal to little kids, but there’s plenty of physical slapstick, sophisticated in-jokes, and all around adorability to rope in older siblings and even parents as well. Along the way, they pass for humans with thrift-store disguises, dine in a fancy restaurant, even spent some time in the slammer thanks to an overzealous animal control officer. Shaun finds time to woo a rather homely canine, while the farmer unwittingly uses his sheep-shearing abilities to become the toast of the city’s high-fashion scene. “Shaun’ isn’t quite as magical as “Chicken Run” or “Curse of the Were-Rabbit,” not amounting to much more than a series of gags. But they are brilliant gags, and come spewing forth in giddy waves that easily sustain a feature-length film. It takes so long for Aardman to make one of these stop-motion animated wonders that it would be a true tragedy if they ever made a dud. Hasn’t happened yet.